Why Black Mountain Wealth Management? We think we’ve got the best jobs in the world because we have the opportunity to help people work toward the goals they cherish—and we love doing it. Every day, there’s yet another rewarding experience that keeps us coming back to work enthusiastically. Helping clients feel confident about the future. Working with clients to help achieve their goals. We hope you’ll give us the chance to help you target your goals. We entirely believe in the power of individual choice. After all, it was that same power that founded our practice! When you go to a financial professional with a famous Wall Street name, you don’t necessarily get that choice. While many big name firms offer quality investment products, the ones that a financial professional can offer may be chosen by people who don’t know you. These firms also may impose sales quotas on the financial professional helping you. In other words, your investment choices may be limited choices, and there may be hidden agendas. We don’t think that’s the right way to do business. One thing you’ll notice about our team is that we’re friendly,down to earth and good listeners. Having been in the business a long time, we’ve encountered this mix of attitudes—and a whole lot of market cycles (both good and bad!). We’ve got a lot of perspective that can help keep you on an even keel through the ups and downs. …in the way we’d want to be cared for. We founded our practice to be the kind of place where we’d want to be clients, if we didn’t already work here! We’d want to be respected, informed and heard. We don’t expect our clients to demand any less. At Black Mountain Wealth Management, we follow prudent financial principles. We treat your money responsibly. As your needs or financial picture changes, we’ll work with you to adjust your course of action accordingly. We monitor your portfolio’s performance so you don’t have to. We understand that investing is more than just a numbers game. There’s emotion involved as well. People assign different values to money and approach investing for many reasons. The so-called best investments aren’t necessarily the best for everyone. When we first get to know each other, we’ll ask you a lot of questions so that we can learn about you as a person, and we’ll tailor your investments accordingly. We want to be just as excited about your financial goals as you are. You don’t have to know the difference between financial products when you come to see us. We’re happy to explain it to you if you’re curious. If you’re not, that’s okay, too. Some clients want to take more of a hands-on role in the investment process; others want nothing to do with it. Either way, our goal is to help you feel confident that your money is working effectively for you. Patrick holds the Series 7, 24, 63, 65 securities registrations. He holds a life and health insurance license for the state of Nevada. 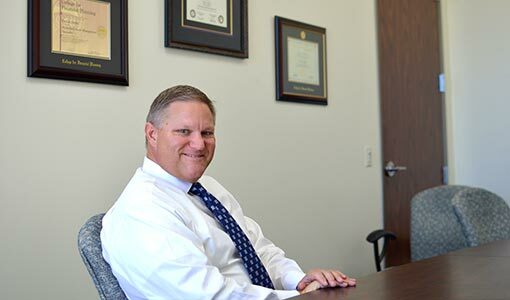 Additionally, he has the Accredited Asset Management Specialist (AAMS®) and the Chartered Retirement Plans Specialist (CRPS®) designations from the College of Financial Planning, and is an Accredited Investment Fiduciary® (AIF®) designee from Fi360. Patrick founded Black Mountain Wealth Management in 2011. He is responsible for advising clients in making investment decisions and financial planning. He has 22 years of experience helping clients to achieve their goals. I believe in being educated and enjoy educating my clients, helping them to achieve the things that are important to them and along the way saving for retirement. Right up there with owning a home, I think the American dream is to retire in such a way that in the later years, after working so hard, you can enjoy some of the things you’ve always wanted to do. You know, the things you are waiting to do after the kids get out of college and you no longer have a job or business to run. There is nothing that pleases me more than to see my clients achieve what they desire in retirement. To better help clients with their investments, estate planning, financial planning, tax planning, and insurance, I achieved the AAMS designation. In addition, due to the complexity of retirement plans and fiduciary responsibility, I attained the CRPS® designation in order to help business owners navigate their way through the retirement plan process. My philosophy, especially after travelling as a young boy through Europe gave me an appreciation for how fortunate I was to be American and live in a country where so many options exist. It was from a young age that I began to realize what freedom meant to me. I see freedom as the gift to have options. It’s the same philosophy that I apply when creating a financial plan for clients. I want my clients to be able to have the freedom to pursue options and be able to choose how they want to live their life, especially during their retirement years. I was raised in San Francisco Bay area. “California Dreaming” was all I knew until 1976 when my parents decided to pack up our family and move. Well, we kids—my brother, sister, and I—thought moving across town would be great . . . until we heard “London, England.” In July 1976, America’s bicentennial year, we moved to a sleepy little hamlet, southwest of central London, called Wimbledon. Yes, the home of Grass Court Tennis. The next two years led to the person I am today. We traveled to Wales, Scotland, Austria, Germany, Spain, Greece, Italy, Turkey, Egypt, and Israel. Whirlwind tours of museums, historical sites, churches, landmarks, and of course battlefields, shaped my love of history. I came back a changed person. My appreciation of the human spirit and endeavors throughout time was formed. I knew nothing of anything over 50 years old before leaving California. When I came back, I had seen, climbed, and dreamed about 2,000- to 4,000-year-old ancient marvels. In 1980, I was accepted into De La Salle High School, the same high school that the movie When the Game Stands Tall was about. Yes, I knew most of the coaches and no, I didn’t play football. However the school helped me to realize the importance of relationships. To this day I have a group of friends that have stayed in touch. We have been best friends for over 35 years. That can only be accomplished by accepting people for who they are, faults and all. I attended San Francisco State University and graduated with a degree in international finance. I moved to Las Vegas in 1993, and shortly thereafter I met my wife, Christy.